ICICI Bank UK topples Marcus Savings with new best-buy 1.55% rate – will it stick? ICICI Bank has squared up to Marcus Bank and other rivals at the top of the easy-access savings tables with a new standalone best buy 1.55 per cent rate. This pushes the average top five easy-access rates to a three year high, according to figures from experts at website Savings Champion. The last provider to offer a rate of 1.55 per cent was Nottingham Building Society at the end of last October, a deal so popular that the small provider withdrew it after just 48 hours. The new HiSAVE account beats the rest of the pack by a 0.05 percentage point lead – but there is no guarantee how long it will stick around. It comes as savings rates across easy-access, fixed-rates and Isas continue to nudge slightly higher in recent months. To open the ICICI Bank account requires £1,000. HiSAVE accounts are managed online or over the telephone. Deposits with the bank are fully protected by the Financial Services Compensation Scheme up to £85,000 per person. The rate includes a 0.15 percentage point 12-month bonus, so savers will want to review rates after a year. 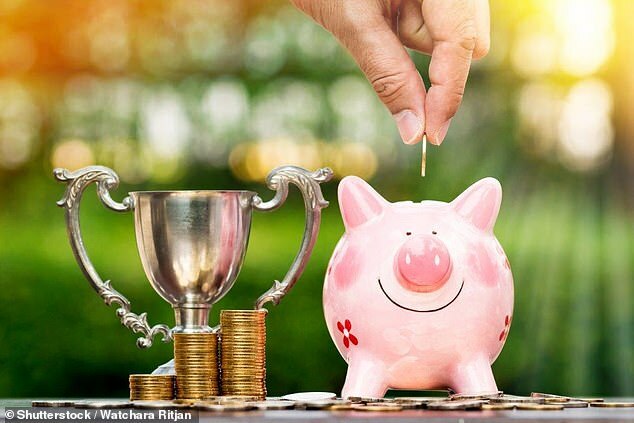 Easy-access savings rates have remained fairly stagnant over recent months with interest peaking at 1.5 per cent since Goldman Sachs launched Marcus account in September 2018. Since no bank that has stuck their head above the parapet to beat it have lasted long. A few more have boosted their rates to equal the Wall Street behemoth, including Cynergy Bank, Virgin Money and West Bromwich Building Society. Average easy-access rates sit far below the best deals at just 0.53 per cent, according to Savings Champion, that’s a difference of 1.02 per cent. 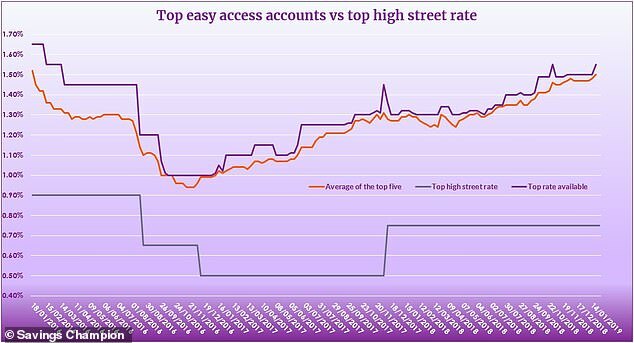 Over the course of a year that means savers would lose out on as much as £102.98 in interest on a £10,000 pot sat in the average account, compared to the best deals. Savings experts agree that’s the new deal is great news for savers, the rate is unlikely to last long. And unfortunately the new rate might not signal the turn in the tide that savers want. Anna Bowes, co-founder of Savings Champion, says: ‘The entrance of Marcus by Goldman Sachs into the easy access best buy tables had an immediate impact and has helped drive best buy rates upwards, especially as it has remained available for a long time. ‘ICICI is a name that many will be unfamiliar with, whereas Goldman Sachs is not. As a result, other providers will probably feel less threatened, so I wouldn’t expect to see another leap in the competition as a result of this new account from ICICI. Rachel Springall, finance expert at Moneyfacts.co.uk, advises savers to look to lesser-known brands such as ICICI to get the best rates. She says: ‘It’s fantastic to see more competition in the easy access market, especially as many savers would use this type of account because of their simplicity and flexibility. ‘At a time of economic uncertainty, savers may well turn to easy access accounts so that they have instant access to their money, so it’s good to see providers improving their range to accommodate demand. Fixed term and Isa savings accounts however have been going up. Last week saw two new best-buy deals to give savers a boost. Gatehouse Bank launched a new inflation-busting one-year fixed rate account paying 2.15 per cent. Even better This is Money unearthed a clever trick that could effectively bag you a rate of up to 2.34 per cent through savings marketplace Raisin. Coventry Building Society also pushed up its rates giving them a clean sweep of the fixed-rate cash Isa tables, including a one-year deal paying 1.7 per cent (also offered by Aldermore) and a two-year fix at 1.9 per cent.